Many people automatically give the remedy Thuja after a vaccination, but it’s not the only remedy indicated for vaccine reactions. Silica is also a very important remedy in this regard. However, it’s important to remember that treating a reaction to vaccines is no different from treating anything else with homeopathy – the best remedy to give is the one that matches the symptom picture the dog is displaying. Taking etiology into account (i.e. 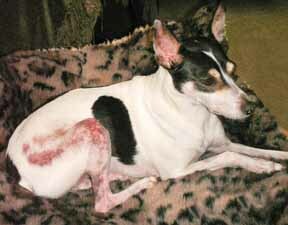 the factors which predispose the dog toward a certain disorder) is always a part of proper casetaking. If we look up Generals, vaccination after in the Complete Repertory, 41 remedies are listed. Looking at the most prominent of these, and disregarding those that are more specific to vaccines that are NOT received by dogs – like smallpox – we are left with: Ant Tart, Apis, Arsenicum,Belladonna, Malandrinum, Medorrhinum, Merc Sol, Mezereum, Psorinum, Silica, Sulphur, Thuja,Tuberculinum. So, as you can see, it’s not exactly a cut and dried choice based on etiology alone. The choice of remedy should be based on the symptom picture, which can manifest anywhere between several hours and several months – or even several years – after vaccination.